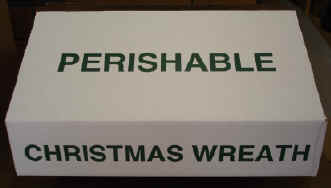 Attractive 175 pound test, white cartons with “Christmas Wreaths Perishable” printed in green lettering. 5 inches deep to accommodate decorated wreaths up to 24 inches. Our boxes are 1/2 ” wider than the standard boxes, and top loading which helps avoid crushing the wreath and decorations. O.D. shipped flat – easy assembly.